This post is excessively tardy but better late than never, right? 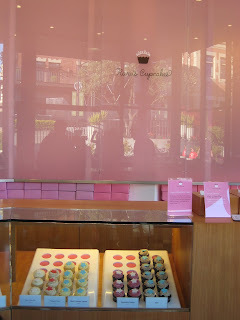 I spent a week in San Fran this summer and was able to squeeze in a cupcake stop on my trip. While touring the city, I found Kara's Cupcakes, located in Ghirardelli Square. There's actually a second San Fran location in the Marina, but this was the one I made it to. The decor is bright and welcoming, with full store front windows and hot pink walls. I couldn't choose just one cupcake to try and luckily my boyfriend was with me so I made the excuse that it was one for each and bought two. I've been super into lemon cupcakes so I grabbed one of those and a chocolate ganache as well. I liked the chocolate much better -- the ganache had a great flavor and the chocolate cake was rich and delicious. I was disappointed with the lemon though. It just wasn't anything special. I know of a few other bakeries in the city that I didn't have a chance to make. I wouldn't say this is a must-have but if you're in the square, why not? !